Our superior quality bedrooms have been carefully designed and offer what you would expect and more from a quality bed and breakfast. 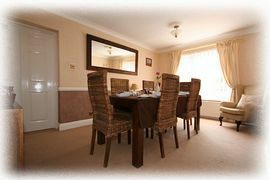 All rooms have been refurbished to a high standard and provide what we would expect when using a B&B. 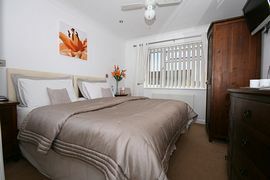 Whether you choose between our Double/Twin bedrooms with en-suite spa bath or super sized shower or if traveling alone our Single bedroom with private fully tiled shower room, you can be assured your stay with us will be a relaxing and comfortable one. Your room will feature: Television, music centre, alarm clock, hair dryer, comprehensive beverage tray, complimentary fresh fruit basket, and wine upon arrival. Freshly cooked breakfasts, selected from our extensive menu are taken in our modern dining room. Special diets can be catered for. From A 23 (Hickstead) take the A2300 signposted to Burgess Hill and follow signs to town centre. At traffic lights junction of Royal George Road turn right onto London Road then left at the roundabout into Queen Elizabeth Avenue. At the roundabout at the top of Queen Elizabeth Avenue bear right, passing Burgess Hill railway station and turn right at the next roundabout into Keymer Road. At the next roundabout turn left into Folders Lane. In half a mile turn left into Kings Way. The Holt is situated approx half a mile on the left. 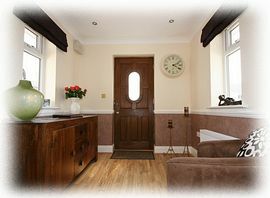 Single with private shower room £35.00 - £40.00 Per room. Double/Twin with ensuite shower room £65.00 - £80.00 Per Room. Open all year except Christmas and New Year 23rd December - 2nd January.